Genre: American Football; Extreme Sports. Recently, Jon Hare of Sensible Software fame spoke about how the Speedball 2 HD redux was framed with what he called ‘communal multiplayer’ in mind. Massively massive online shenanigans has kind of made the concept a lesser spotted beast amongst gamers, but back in yonder day there was something quite special about this particular brand of play. It usually involved a tiny corner of the bedroom with an Amiga disk-drive chugging away in the background and a d!ckhead brother for company, but there was little else more joyous than each of you mashing the f*ck out of a zipstick in an attempt to totally humiliate the other on the likes of Sensible Soccer, Kick Off or the aforementioned Speedball 2. The simple joys of rubbing it in when you pulled off a spectacularly sublime piece of skill entwined with the calls of ‘lucky git’ or that the game was cheating you were a constant delight. No spikey 12-year-olds screaming death-threats down a head-set here; a good old-fashioned brotherly wrestle would sort out any disputes. 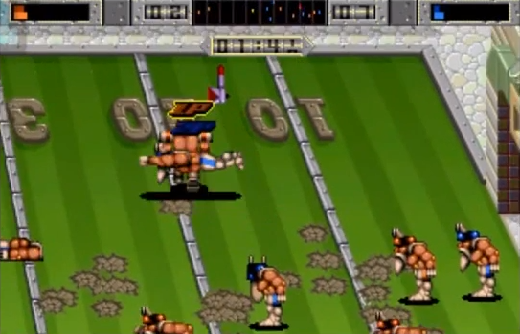 Within this context Brutal Sports Football was a particular highlight of the communal multiplayer scene. 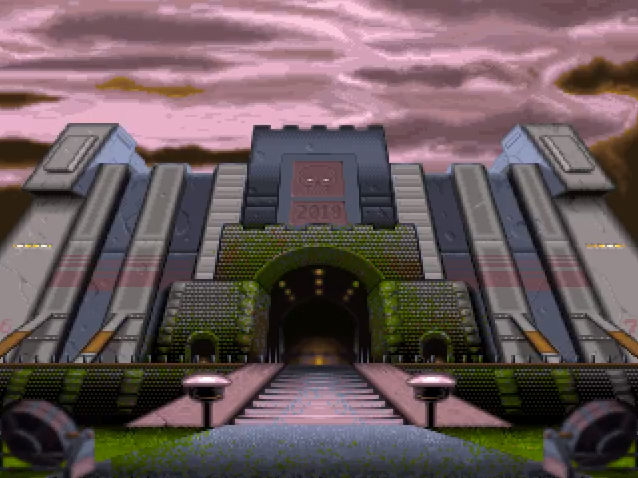 That it was particularly Brutal is perhaps why most former Amiga owners find it a relatively memorable experience. 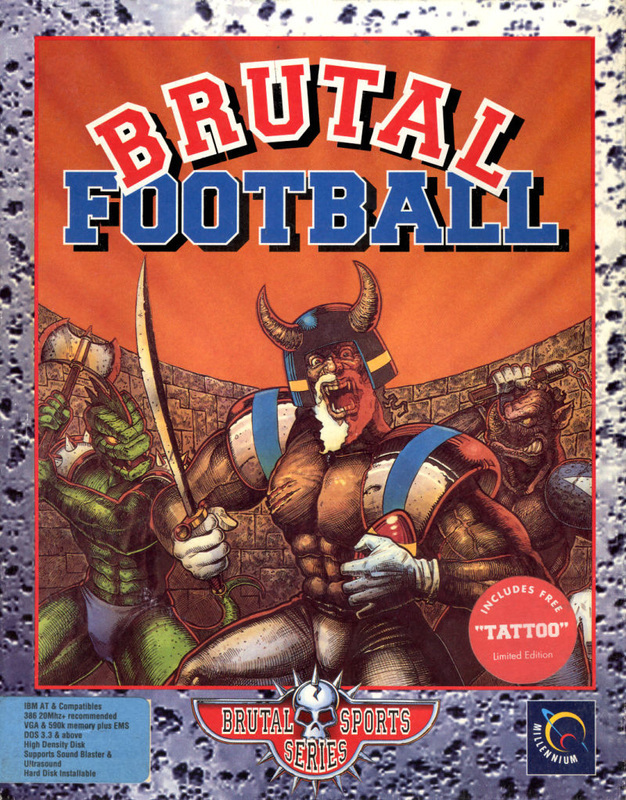 A hybrid of rugby and American football in a fantasy setting with Viking/Northmen using weapons to beat the blue hell out of the opposition, Brutal Sports Football fully fitted into the Blood Bowl zeitgeist of the early nineties. Punching opponents and stamping on them whilst they are down is gleefully encouraged alongside the more traditional method of tackling. Swords and shields endeavour to make the beatings even more deadly. The more damage received the increasing likelihood that a player will cark it, at which point a truly beautiful thing happens. With too much punishment taken the player’s head pops off in a shower of gore, much like a furious champagne cork ready to explode. And everyone loves a little bit of head. From Ash lopping off his girlfriend’s noggin with a blunt shovel in Evil Dead 2 to wrestling fans chanting ‘we want head’ whenever Al Snow made an appearance, decapitation is pleasantly cathartic. 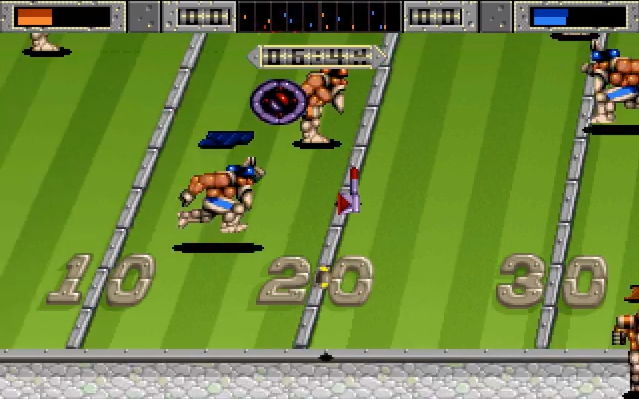 Obviously, more game does exist but in two player mode scoring was often left on the side-lines so that the constant beatings could reign supreme. With victory possible through outright decimation of your opponent’s team why would you not choose this option? If for some reason you did contend with playing the game like a gimp… eh, I mean less ruthlessly, then Brutal Sports Football begins to resemble a more straightforward sports title. Played across two-halves of seven minutes each, the aim is simply to score more goals than the other team. With two goals set into the brickwork at either end of a lovingly styled gladiatorial arena the ball can be kicked, thrown or run into the opposition goal to register a score. Quite simple really! Of course, the brutal tactics available make this more complicated, as do power-ups that can turn a game swiftly. Freeze blocks, lightning bolts and grenades add to the carnage, but having the ball sprout legs so it can run in the direction of the goal you are attacking is much more cunningly observed. Hares and tortoises occasionally run across the battlefield as well, affecting player speed respectively. The chance to experience a 2019 without social media! ​In addition Brutal Sports Football is a good looking game to get ones retinas around. The big cartoonish players are well defined against a lovingly crafted and colourful playing field. The little touches are equally appealing, be it the turf slowly becoming ever more tarnished as the game goes on to the corpses remaining littered on the battlefield. You can even pick up the decapitated heads and throw them around for chuckles! Although the scrolling does have a habit of chugging ever so-slightly and the flow of it all never really gets beyond a medium pace (it doesn’t feature Speedball 2’s stark ferocity that’s for sure), sprites are well-animated and perfect for the job in hand. The presentation all around is lovingly designed and music and in-game effects are as they should be. From a communal multiplayer perspective, Brutal Sports Football has most of its sh!t in all the right places. Shame then that when such a concept is removed the game begins to squander as a single player entity. The first concern to strike one’s mono-brow is the lack of depth available. Sure it has a league system to play-through, but this is simply a rinse and repeat exercise. Victory and decapitations provide a variable amount of money at the end of each match yet this can only be spent on keeping your squad of players healthy, which does include reattaching discombobulated heads. There are no transfers, skills upgrades, or bugger all else to do as a management endeavour in the game. It is very much play, recover, play, recover and play until the end of days. Simple and straightforward yes, but pitted against contemporaries the appeal of Brutal Sports Football starts to dwindle. Unfortunately the extent of the single player challenge is also a problem. Battling through four divisions of four teams (six games per division) does provide a perception of longevity, and this is helped along by the unique play-styles of the lizardmen and rhino teams (not available in the sociable gaming mode) on account that the game is doing something slightly different. Alas, it’s a bit of a charade. It doesn’t take long to work out these creature-based teams – mashing them into a bloody pulp usually does the trick - and whilst the AI does scale as you are promoted through the league system this starts from a fairly low baseline. It’s not uncommon to hand out 12-0 thrashings in season 1 and sure, the score-lines do narrow as the A.I. becomes less of a three-legged pony, but not nearly enough to trouble a competent player too much. ​Unfortunately the extent of the single player challenge is also a problem. 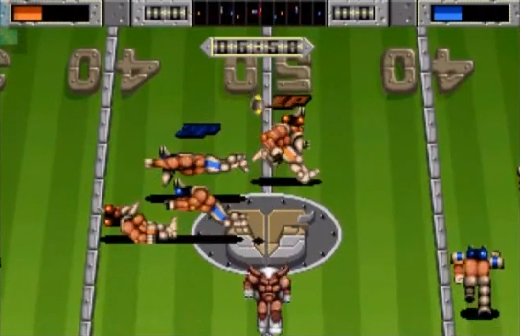 Battling through four divisions of four teams (six games per division) does provide a perception of longevity, and this is helped along by the unique play-styles of the lizardmen and rhino teams (not available in the sociable gaming mode) on account that the game is doing something slightly different. Alas, it’s a bit of a charade. It doesn’t take long to work out these creature-based teams – mashing them into a bloody pulp usually does the trick - and whilst the A.I. does scale as you are promoted through the league system this starts from a fairly low baseline. It’s not uncommon to hand out 12-0 thrashings in season 1 and sure, the score-lines do narrow as the A.I. becomes less of a three-legged pony, but not nearly enough to trouble a competent player too much. Tellingly, there is no Super Nashwan here to constantly p*ss in your cereals; instead infuriatingly difficult opponents are replaced with power-ups that are far too over-powered. Pick up the bunny and you can virtually run the length of the field and score with barely anyone getting close to making a tackle. Likewise, dropping the freeze and lightning power-ups at the right time means you can canter over the line for another score with little difficulty at all. And very gradually Brutal Sports Football gets ever so slightly tedious because the challenge just is not there. This is not helped by the seven minutes per half. An option to change the length of a match would have been welcome, but all it does here is allow a game that you won some five minutes ago to drag on until the end of eternity. Even the cathartic head-popping gradually losses its silly appeal, which probably says everything that needs to be said about the single player venture. Missing the depth and challenge of its contemporaries pretty much relegates Brutal Sports Football to a game of two-halves (and pathetic football clichés, obviously). On the one hand we have a basic single player mode that gets dull all too quickly; on the other a gloriously fun two-player experience that is right up there with the pick of other communal multiplayer titles. It does make me pine for my d*ckhead brother – he’ll be glad to know that he is actually useful for something – for the beatings that were handed out at the fell hand of my mad gaming skills, but dang is that single-player mode disappointing. Ultimately, enjoy it while it lasts but stick with Speedball 2, Sensible Soccer or Kick Off whenever you get that retro itch.